It’s getting close to fair time, so even though it’s a bit out of season to make it (ok, completely out of season) I’ll be making a batch or two of hard candy soon. I love making hard candy. 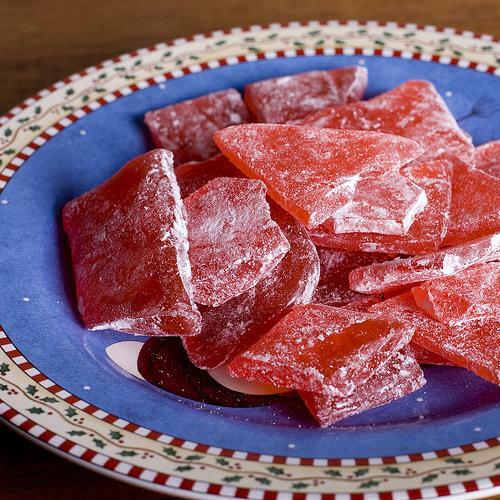 Over the last few years I have made countless batches of hard candy in many different flavors. I’ve learned a few important things in the process. If you make a fruit flavored candy be sure to add a sour component to it. In large saucepan, mix together sugar, corn syrup and water. Stir over medium heat until sugar dissolves. Bring mixture to a boil without stirring. When syrup temperature reaches 260, add color. Do not stir. Boiling action will incorporate color into syrup. Remove from heat at 300 or when drops of syrup form hard brittle threads in cold water. After boiling action ceases, add flavoring and stir. Use caution to avoid rising steam when adding flavoring. Pour syrup into lightly oiled candy molds or onto ungreased cookie sheet and score to mark squares. When cool break into pieces and dust with powdered sugar to prevent sticking. Store in airtight container.